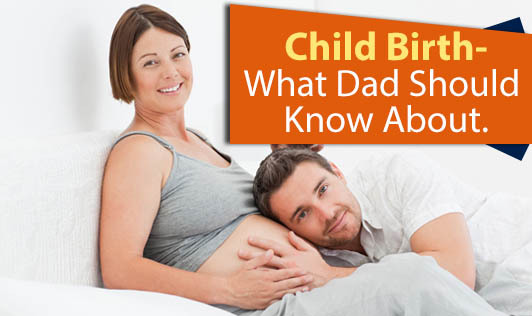 Child Birth - What Dad Should Know About. Knowing what to expect from the birth process can be a really big step to feel more comfortable at birth. The most important tool for this is the communication with your partner, reading the books and browsing the nets. It helps you understand what is likely to be helpful to you and what it is you want out of the birth experience. 1. Ensure of what she wants. Talk to your partner beforehand about what she does and doesn't want during her labor. If she has a birth plan, make sure you bring it with you to hospital. 2. Be flexible. Late in their pregnancy, most women will experience false labor. Contractions may start out strong but taper off and then stop after a while. There will be persistent lower back pain, especially if your partner also complains about a cramps, premenstrual feeling. Give a call to your physician to find out what exactly it could be or rush her to the hospital if it's true contractions. 3. Don't get to the hospital too early. Physician might tell on how to time the contractions and when is she ready for delivery. 4. Be an active participant. In the days and weeks before your baby's due date, make sure both you and your wife are packed for the hospital, including a possible change of clothes, toiletries, camera and other essentials. If you have a birth plan, you may need to let the labor and delivery nurses know about it. 5. Remind her to ward off dehydration. During early labor, remind your partner to drink plenty of liquids. Pour her a glass of non acidic juice such as apple juice or pineapple juice, honey and water, an herbal tea, or just plain water to ward off dehydration. She might not get anything solid to eat at the hospital for many hours after the baby's birth. 6. Drive carefully. Be safe, when you head to the hospital. This isn't the time for taking unnecessary chances. When you get to the labor room, stick around to provide comfort and support. 7. Don't have long conversations on your mobile with friends and colleagues while your wife labors. 8. Be prepared to wait. Unlike what you see in films and on television, most women are in labor for hours before they even go to the hospital. After labor, don't be surprised if your baby's skin looks wrinkled or his head is molded. Everything will take its shape soon. Finally, you have a big role in helping your partner get comfortable and in communicating her wishes. Be present in every way - don't let your fatigue or fear take your attention away from her emotional and physical needs.